Meet up with Aira and Lumia at the music school on the floating island for some adventuring! Listen to Sebastian the bird sing a tune while the elves accompany him on the instruments. Wait, what’s that in the sky? It’s Phyll the evil shadow bat in an airship, and it's attacking Cyclo the Guardian Wind Dragon! Find and build the hidden cyclone bow to help protect the magic Wind diamond before Phyll flies away with it! Price is 33% below the initial Lego retail price, a € 15.00 discount! This comes down to 6.65 cent per brick. The Aira & the Song of the Wind Dragon (41193) Lego set is available from the sites below. However, they do not offer delivery to your selected region. 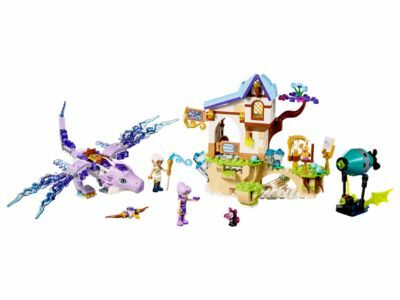 The Aira & the Song of the Wind Dragon (41193) Lego set is no longer directly available from the sites below. However, 3rd party partners of these sites might still have the set available. Alternate description Join forces with Aira and Lumia to protect the Wind Dragon! Includes Aira and Lumia mini-doll figures, plus Sebastian the bird and Phyll the shadow bat figures. Features a buildable Cyclo the Guardian Wind Dragon figure with transparent wings, movable head, legs and tail, opening jaw, space for 2 mini-doll figures, and space on the head for a magic Wind ‘diamond'. Also includes a 3-level music school with opening entrance door, rotating sign and 2 hiding places, ‘floating' island that moves by sliding the lever, and a bat airship with shooting function and spinning propeller. Slide the lever on the back of the music school to move the ‘floating’ island from one side of the school to the other. Lift the special ground section in the music area to find the secret plans to the cyclone bow. Discover the hidden box in the basement of the music school to retrieve and construct the cyclone bow. Accessory elements include 2 shooting studs, a cherry, harp, music notes, conductor's baton, bow instructions, magical Wind ‘diamond', Lumia's power-up staff, bed, cherry cupcake, lute, organ and a chest, plus a buildable cyclone bow. This amazing toy for girls and boys is suitable for ages 8-12. Guardian Wind Dragon measures over 2” (7cm) high, 8” (21cm) long and 9” (25cm) wide. Music School measures over 5” (15cm) high, 3” (10cm) wide and 1” (5cm) deep. Airship measures over 3” (8cm) high, 2” (7cm) long and 3” (8cm) wide.